Sow seeds directly after final frost? I’ve heard several reports this is difficult to start from seed. If you’ve tried seeds, please comment below. Needs overwintering indoors for colder regions, but you can cut it back so it won’t take up much space. Our vine overwinters in a 12″ container. Pseudogynoxus chenopodioides grows well in pots. We grow ours in a 12″ pot and cut back the root system in fall, if necessary. Average water needs. I found that the vine growth habit seemed to shade the mulch/soil so the plant required less water. This is one butterfly vine where I recommend buying plants, because I’ve heard numerous reports about difficulty starting from seed. The good news is, once you have plants it’s easy to propagate from cuttings. Is this Mexican Live Vine rabbit proof? Hi Chic, I’m not sure if anything is rabbit PROOF, but we’ve never had rabbits touch ours in containers. I’ve also never heard anyone else report a rabbit issue with MFV wither. As a groundsel (Senecio tribe of daisies) it is almost certainly a potent liver toxin to mammals. Bunnies will probably eat other stuff first. 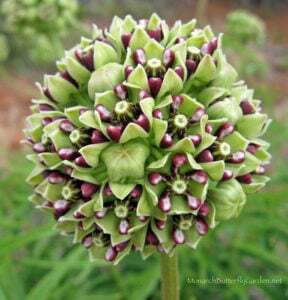 The pyrolizidine alkaloid toxins are raw materials for milkweed butterflies to manufacture their pheromone, danaidal (without which queens can’t breed successfully), which is probably one reason it is popuplar with them. What about deer. Will they eat this vine? In Texas. They roam the yard at night . Afraid to hang basket until i know what they will do! Hi Judith, I have never heard of deer eating this (yet) but it seems deer will eat just about anything if they get hungry enough. You could always try and see what happens…good luck! I was surprised to see a Gulf Fritillary caterpillar on our MFV. We live in Dallas, Zone 8a. Not sure whether it was fluke or not. Hi Allan, I’ve heard other reports of gulf frits sipping nectar from MFV flowers…enjoy! I had to take mine out of the pots because they got rootbound really fast. Six months. Hi Elly, we have not grown it before. 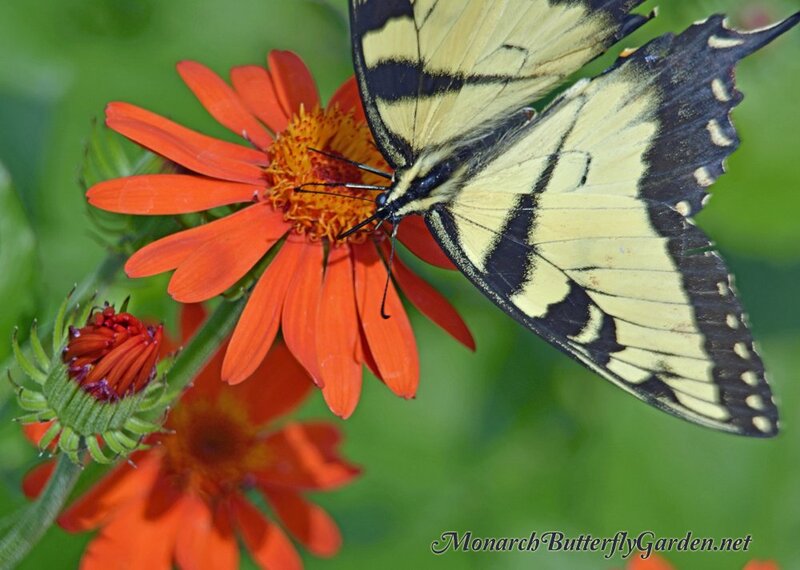 If the nectar content is the same, it should be a great addition to the garden…perhaps try one of both and see if you notice a difference in butterfly visits…good luck! Do you know anything about the slightly redder version of the Mexican Flame vine, Senecio confusus ‘Sao Paulo’? I am wondering if Monarchs like it as much as the orange variety. Please advise. How do you think Mexican Flame Vines will do in Bonsai Jack’s Cactus and Succulent Soil Mix #111? I just bought some MFV’s after buying some Senecio Jacobsenii. Hi Kay, if you take a vine cutting and dip it in rooting hormone powder you can plant it directly in soil. Otherwise, you can also get it to root in water. It roots pretty easily. We’re reaching the end of the season here, and I’m planning my gardening changes for next year. 🙂 Do you think MFV will compete okay with Honeyvine milkweed if I plant them a few feet apart on the same chainlink fence? (I know the MFV will be an annual if I put it in the ground, but I can take cuttings in the fall) Or will the honeyvine totally overrun it? I’ve been planting Profusion zinnias there, but 2 years in a row the monarchs have ignored those (I have seen a few painted ladies on them just recently) so it’s time for something different. Hi Bob, I’m not sure….we have a couple honeyvine (new this season) and I think I’m keeping them in a container outside over winter. It should be easy enough to cut back honeyvine if it ‘crosses the line’. Otherwise, both plants grow pretty quickly. 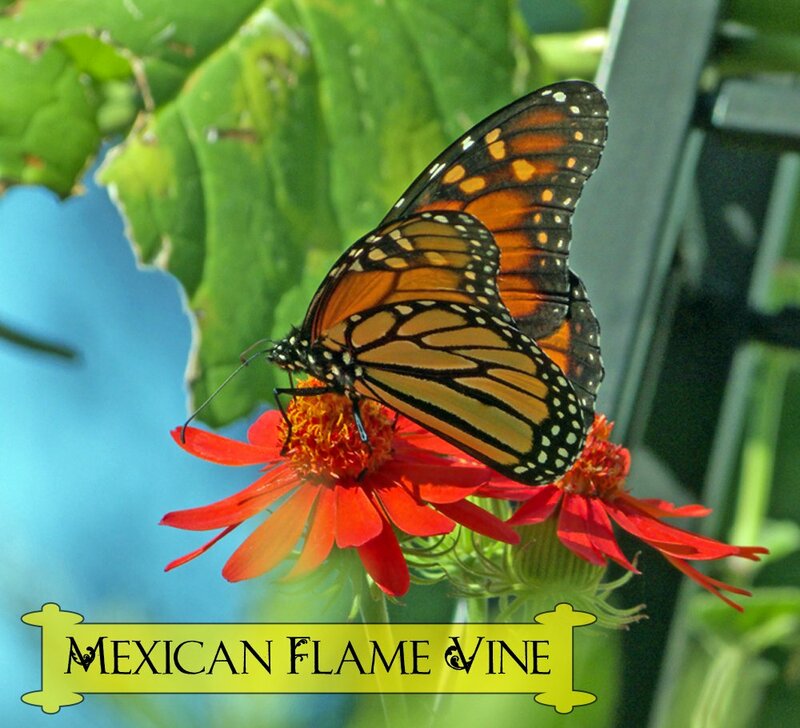 Is Mexican Flame Vine the same plant as Mexican Sunflower? Tithonia? My MFV seeds took months to sprout. I had almost given up on them, but now they are healthy fast growing vines in mostly full sun, climbing up a tall wrought iron fence. They have not produced a single flower, yet. though the vines are many feet tall and very lush. Any suggestions about how to encourage flowers? Hi Claudia, our plant has taken an unusually long time to bloom this season, but I added a bloom boost fertilizer with more phosphate and there are lots of buds forming on it now…in our northern region (Minnesota) it seems to be happiest in September when it starts cooling down…strange! Tony, how do you treat your Mexican flame vine over winter? Do you keep it under lights, in a window or let it go completely dormant? I live in Houston Texas. Do you think the MFV would do well here? I’ve never had one before. Our winters are not very cold like yours. Do you have any pointers for me? Hi Debbie, it’s cold hardy to zone 9a so it should be a perennial for your region. I’m in Minnesota so I can’t give you first hand growing tips for Texas. 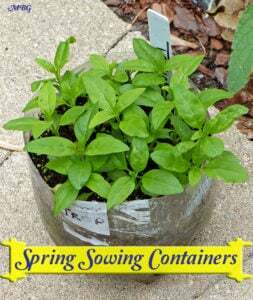 It grows well up north as a container plant, but you have the option to plant directly too. I live in northeast Kansas. Does anyone know where I can buy a Mexican flame vine ? Thanks. Hi Mary, almostedenplants.com has it listed under Red Mexican Love Vine, at least I think it’s the same. I have ordered passiflora from them and the plants were very healthy and larger than normal mail-order. Hi! We have a mountainside in our backyard with part of it excavated with a winding walkway up to a large landing. We want to green up the excavated dirt/rock walls. It’s about an 8 ft wall that we want lots of greenery. It’s sloped. Do we plant in the garden bed to grow up the wall to landing or do we grow from the edge of the landing above and have plant hang or grow down to the ground of our backyard? We’re thinking we have it grow up. We probably need to put up some structures to help it grow up th wall. How fast does it grow in one season typically? Thanks! Do the deer and rabbits seem to be attracted to the Mexican flame vine? I want to try it this year, but the only place I have available is in an unprotected area. Hi Terry, I have never noticed any rabbit-munching on our Mexican flame vine in the five years we’ve grown it. I’ve also never heard reports of deer feeding on them, so hopefully they will stay away. Good luck and keep us posted on your vine! Hi Anne, I would cut back affected sections of the plant and try spot treating remaining bugs with a cotton swab dipped in isopropyl alcohol. good luck! I am based in Los Angeles and ever since last spring my flame vines have been battling aphids. Any advise? I am really struggling with this and have tried non-toxic remedies as well as straight up poison. Have you encountered this before and also do you have recommendations for a fertilizer? Hi Shannon, the only time I have seen aphids on MVF was when I was overwintering indoors. To get rid of them, I cut back the affected areas and threw them out and did spot treatment with isopropyl alcohol using cotton swabs. 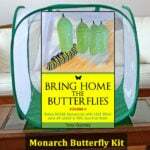 I am so glad I found you and am so excited to be able to find such great infor for my Monarchs. 4 yrs ago I planted a Butterfly garden with a young Dogwood tree in center with a butterfly bush, lantanna, salvia and curassiica milkweed. I learned that when you plant for butterflies your garden is for not just your Butterflies but all the birds and bees of all varieties. Monarchs just showed up two yrs ago and even tho they had also the bamboo milkweed I ha no eggs etc. With the drought I have lost many plants and bought the silky gold milkweed this yr and have experienced cats-tried to bring in on leaves-had 16-nine died right away-some molted and one cocooned-now that I have your invaluable infor I am sure I need to freeze the crysallid (sorry) as it has been 14 days. I ordered your suggested Orange Flame. 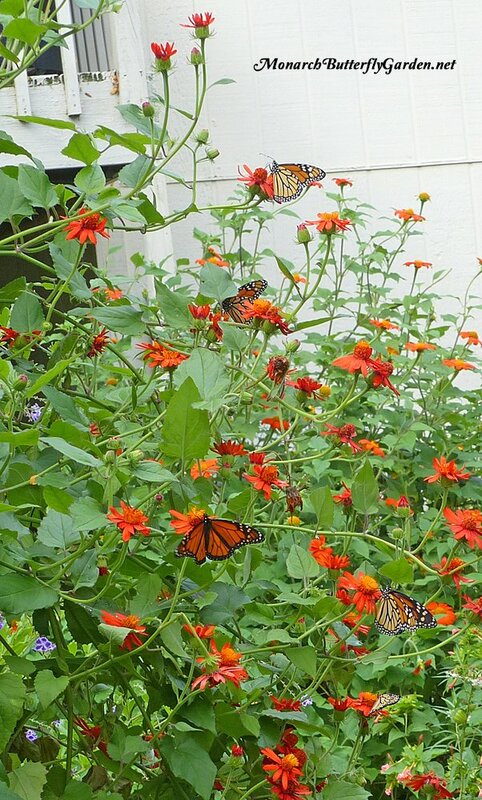 Thank you for all your help and look forward to following along with everyone and to try and raise Beautiful Monarchs and planting more milkweed as hosts. Hi Beverly, I’m happy to hear you are having success with your garden. 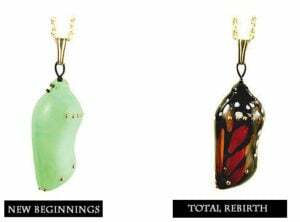 If your chrysalis is green and looks healthy, I would give it a chance. Good luck and enjoy your Mexican flame vine! My wife and I planted a MFV about a year ago and it grew fast and had an amazing bloom for a long time. When we started dead heading, the blooms were less and less until almost all green. Just a couple of days ago we were working in our butterfly garden and noticed the MFV was all droopy. We have tried increasing water, fertilizing and still no improvement. Any suggestions??? Hi Manny, it has always bloomed prolifically in our northern climate, and we always deadhead. If you’re adding nurtients, use a fertilizer that promotes flowering and not a general all-purpose fertilizer. I hope your blooms return soon! We have been using a general fertilizer. We will give a flowering fertilizer a try. Thank you! Tony, what a wonderful page. We are working very hard to fill our backyard with various attractions and nutrients for the bees and butterflies. We planted a trumpet vine @ 8 years ago and it became so invasive that we have struggled to rid ourselves of it for about five years now, with very little success. I love the Mexican Flame Vine and I read that it can be invasive but the roots are easily pulled. How would you compare this vine to the Trumpet Vine in terms of containment? By the way, I like the idea of using a container which would also minimize the invasiveness. We do live in the Willamette Valley in Oregon which is zone 8, fairly moderate and like you I could winter the vine indoors as I do my Mandevilla. How large a pot do you recommend to winter one in when pruned back? we’ve never grown trumpet vine so I can’t compared the two…plus I’m in zone 5 so the plants have no chance of survival. Try growing in a 14″ or 16″ pot. But, if you’re not potting until fall you can make that decision when you look at the root system. The plant still grows very vigorously in a container and ours has already covered our windmill trellis with beautiful orange blooms. We have had the same plant for a few years now, but you can easily start new plants with cuttings. Hi Tony, I am wanting to plant plants that will attract bees, humming birds and butterflies. I found Mexican Flame Vine but I don’t have a trellis garden, but I have a tree that died this last winder. Do you think it will work as a trellis. 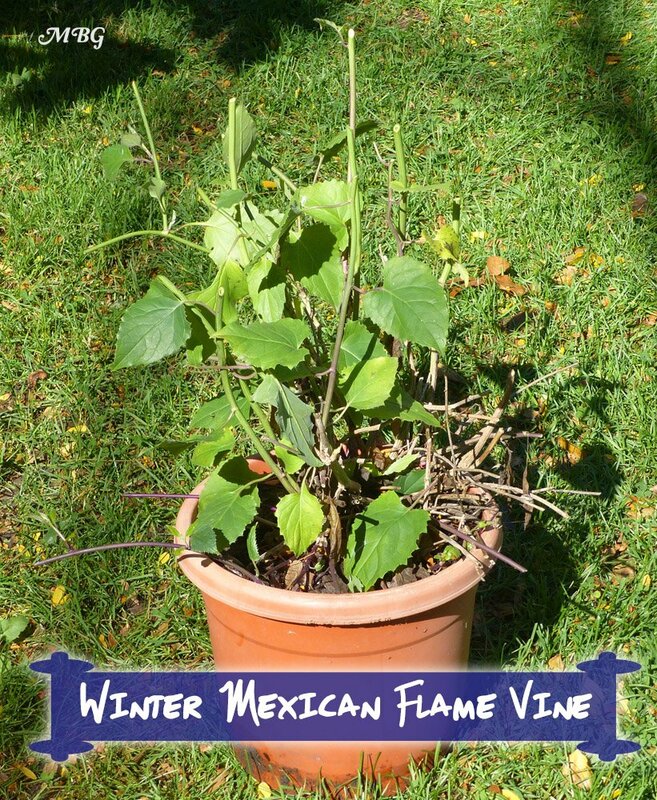 I’ve purchased 2 Mexican Flame vines early spring. They were blooming then. I’ve dead headed the spent blooms and since then, NOTHING! The vine continues to grow in full sun and appears to be thriving. Ps, I live in Sugar Land, Texas, near Houston. The plants are still in pots, if this info helps. Hi Donna, if you’re using an all-purpose fertilizer, switch to one specifically to promote blooming. We’ve grown ours in a container for years and not had an issue with blooming. If your plant is root-bound, that could be an issue…I always check ours at the end of the season and trim down the root system if necessary…good luck! Hi Kirstin, from what I hear, it’s very difficult to start from seed but super easy to start new plants with stem cuttings in water or soil. If you can find a plant, I would opt for that. I’m not aware of vendors that ship to your region, so you will have to look around…good luck! This is a climbing vine according to the descriptions. I’d like to know how it attaches? Does the plant vine loop itself around the trellis, or does it have gripping tendrils that entwine around the trellis like some melons do? Does it have air roots that will lock into a concrete block wall? I want to use this to hide a block wall. I need to know if I need trellises, or if I can just run some wires horizontally along the wall a few inches apart and let it grab onto that. Hi Mo, unless I’m remembering wrong, this one just vines around the trellis with multiple vines. I can let you know for sure in a couple weeks. Your plan should work if you guide the vine a bit and tie it to the wire to get it started. It’s worth a shot…good luck! I have mine on a fence and have screws in the wood every 4ft….. then I just wound fishing line…. It’s climbing it like crazy! So glad to read this info- I’m in Austin and we had such a mild winter the vine I planted last spring not only survived but has bloomed and just been showing off like crazy. The trelis is solid orange blooms, which I just realized are scented! Six Queen butterflies on it as I type. All this on March 3rd. Wow! I cut half a dozen vine tendrils from my MFV in December, and rooted them in water. There seem to be plenty of long thin roots already. How long can I keep the cuttings in water? And do you have advice on type of potting soil or whatever, for the interim planting, before their final destination in a planter pot? Hi Susie, I planted ours in an all-purpose potting mix- pro mix brand. In our northern region, the plant grew very slow its first season. You could try starting it out in a smaller container. We keep our mature plant in a 12″ container and cut the root system back in fall. This has worked well in a cold climate and overwintering indoors. Hi Susie, the longer they are submerged in water, the more you have to worry about rotting, but you should probably be ok. good luck! Hi Marilyn, it’s supposed to be hardy down to 20 degrees, so it should come back as the temps increase. I have never left ours out in freezing temps though, so you’ll have to see what happens. Good luck! PS..we brings ours indoors (Minnesota) over winter and it always responds well to heavy pruning. How severely can I prune my MFV without killing it or negatively impacting its blooming behavior. Several years old and lots of dead foliage in center. Want to clean it up and redirect its growth. Hi Sharon, I bring ours indoor every winter and cut it all the way back with no issues. You can also root stem cuttings in water if you want to start new plants. Hello SNOWman!!! I have also tried starting MFV from seed and had no luck. You’ve stated cuttings were the best way to go, so I bought a plant. No problem coming up with cuttings now and I learned another trick too. Start plants from LEAVES!!! I rooted them in dirt outside 7 NOV., have roots but no vine…yet!!! Couldn’t be any easier!!! Thank you for answering. 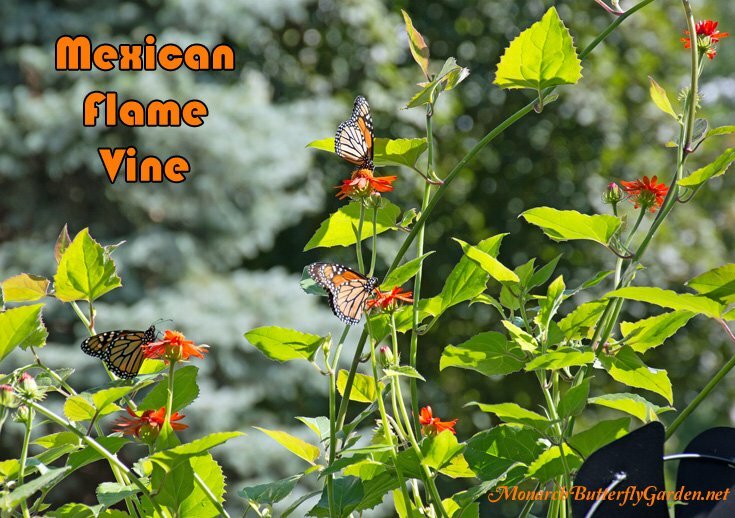 When I read that Monarchs liked this vine, it occurred to me the plant could be toxic. 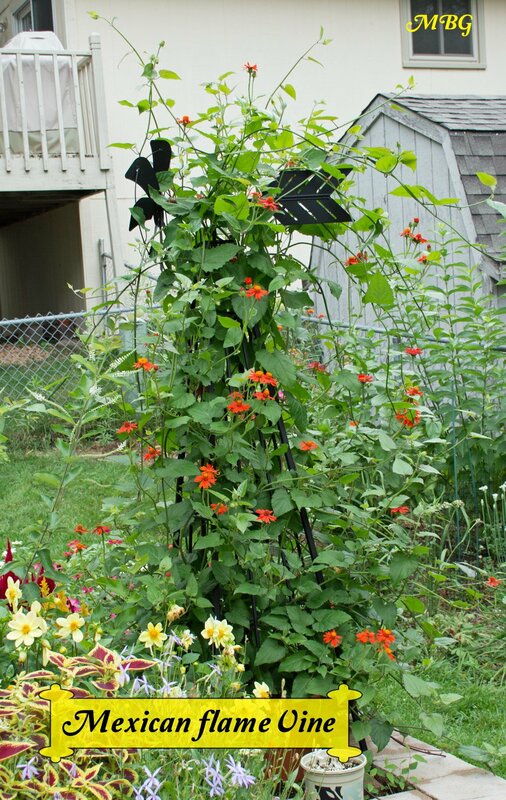 The barrier idea is worth trying because this vine is just so amazing with its vibrant orange flowers and robust health. My dog is still a puppy and curiosity reigns, so she will remain on leash for now. Thank you again. I have this beautiful vine growing abundantly in my back yard, but now I have a new puppy, too. Is plant toxic for dogs or safe? Thank you for any answers to this question. We’ve grown MFV for a few seasons and our dogs have never touched it, or our milkweed for that matter! Most plants that can be potentially dangerous need to be eaten in large quantities for there to be an issue. And have tried everything in a way of flowers booster fertilizer. It’s in full sun. WHAT else can I do? Growing this plant from seed is impossible unless the seed is fresh. Research has shown that seed dies within six months, found this out after many failures, so not the best thing to order from a regular seed co. I guess if you see a vine ask if you can have some seeds. Someone with a plant could do a really good deed and sell fresh seed on ebay. A lot of who us have been trying to grow this plant from seed without success would be delighted with an angel who could would be willing to do that. Hi Richard, thanks for the info about the short viability window for the seed. If you have a link to the research you are talking about, please post another comment. Otherwise, Pseudogynoxus chenopodioides is much easier to start from stem cuttings. Hi Tony! I started a Mexican Flame Vine from seed in my greenhouse this past winter. I had a bunch of seeds but only one germinated and it took a really long time to get growing. But, now it’s in the my trellis planter and it looks happy. There’s even a ladybug hanging out on it. I have a picture of it if you’d like me to send it to you. I’m in Charlottesville, VA.
You inspired me to try to grow it! I’ve read all of your website to see what would be great plants for the Monarchs. Thank you for all of the time and effort you put into making such a great website and great e-books too. Hi Tara, Congrats on getting your Mexican flame vine started…MFV is pretty difficult to start from seed, from what I’ve heard (and experienced myself). Now that you have a mature plant, it’s easy to start new plants from cuttings. I look forwarding to hearing updates on your new climbing vine! Just got a MFV from a local nursery yesterday. Lots of feces on ground around pot this morning. Makes me think a catapillar is eating. Any ideas which species uses MFV for egg laying? Hi Kirk, never had any caterpillars on ours in Minnesota.